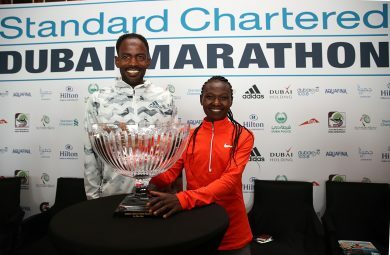 Guye Adola of Ethiopia and Ruth Chepngetich of Kenya have both run faster than the course records set in the Standard Chartered Dubai Marathon last year, so despite the reduction in prize money (of which more later), the organisers of Friday’s 20th running of the Gulf race firmly expect the traditional blanket fast times to continue in what they refer to as the only IAAF Gold Label race in the region. No one could argue that Eliud Kipchoge is currently the best marathon marathon runner in the world, possibly of all time; but the Olympic champion and world record holder was pushed to the limit in the Berlin Marathon 15 months ago, when Adola led the Kenyan until 40k, and in his first marathon, no less. The Ethiopian was rewarded with the fastest debut in history, 2.03.46. As so frequently happens in elite sport, an injury hampered his progress last year, and when sickness contributed to a lowly placing in London 2018, he only finished the race he said, ‘because I owed it to the organisers. Now I feel back close to my best,’ he added before his coach intervened, with the veiled promise, ‘We would not have come if he was not ready’. Neither, if seems does the prospect of racing another elite marathon so soon. ‘I think 50 days is plenty of time to recover,’ she said; and having won the half-marathons of Istanbul, Milan and Paris within two months just under two years ago, who could argue with her? Nevertheless, the traditional deep fields in Dubai suggest that both she and Adola will have their work cut out to add another victory to their records. Among leading rivals, Lemi Berhanu in the men’s race, and Worknesh Degefa in the women’s, have both won here in the recent past, Berhanu in 2015, and Degefa in 2016. And as for those blanket finishes, the record speaks for itself. There have only been three marathons in history where four men ran faster than 2.05, and six women bettered 2.22, both in the same race; and they have all come in Dubai. And in last year’s event, seven men broke 2.05, and four women broke 2.20. So, even though a world record may have eluded them, despite the past presence of Haile Gebrselassie and Kenenisa Bekele, the overall race record reeks excellence. Which brings us to the reasons behind the reduction in prize pot, over the contentious issue of impending rule changes for the coveted IAAF race labels. ‘For the time being,’ said founding Race Director, Peter Connerton, ‘we are going to continue our policy of paying very good prize money ($100,000 for both winners), but not appearance money, as other top races do. Because we believe it’s the performance on the day that counts. ‘The Dubai prize money is reduced for 2019 as a result of a decision by the IAAF to exclude the Dubai Marathon from the opportunity of becoming a Platinum label in the new athletics event ranking system. The Dubai Marathon, with the support of the Dubai Government has since 2008 contributed over US$11 million is prize money, tax free, to the Marathon event, attracting to its shores some of the biggest names in the sport including Haile Gebrselassie and Kenenisa Bekele. ‘The hierarchy of the sport has decided for the marathon that to be a Platinum label you must have 15,000 finishers. By default, this excludes Dubai from that category. After contributing so much to the sport since 2008, we feel let down by the sport, after the initiative of His Royal Highness back in 2007 to promote Dubai and the Marathon’.